All selections published by Marzique Music Co.-BMI, except as indicated. The "bag" of which this album is an especially happy example is unmistakably that deeply satisfying vein of cur-rent jazz expression that has in recent years been identified by such labels as souful, earthy, lunky, down home, and the like. It is decidedly a blues bag (four of the seven selections here are specifically blues, and that spirit is never more than a whisper away on all numbers). 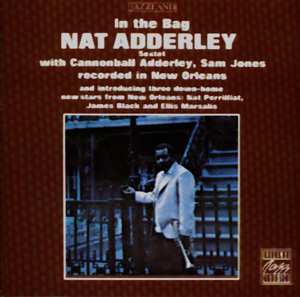 Music of this kind has of course been very closely associated with the name Adderley, largely through the phenomenally successful efforts- both in person and on Riverside records -of the group led by Cannonball, in which the cornet of brother Nat plays so vital a part. The real point is that this off-the-beaten-path setting provided the three experienced jazz stars on the date with a special feeling of freedom and experiment, while putting the three local players at ease (in addition to their having that special boot that goes with the first real chance to be heard, plus the challenge of being heard in such tough company). It also made available several tunes by fresh, vigorous composers who are still free of the cliches that trap so much of the over -hip jazz writing of today. It was during an early 1962 trip to New Orleans that Nat Adderley first heard the jazz that is being played there-mostly at odd moments and in odd places, by men who unavoidably get most of their gigs playing and recording rhythm-and-blues material. He was much impressed, not only by their talent, but also by their unusual degree of sureness and command of their instruments. The Adderleys attribute this to the fact that these men work often, and with all kinds of music-unlike many young musicians elsewhere who get on a jazz.or-nothing kick and consequently frequently suffer long non-working dry spells. Nat immediately was struck with the idea of recording with some of these men. Cannonball enthusiastically seconded the motion and there wasn't too much difficulty in convincing this writer not only that the date should be done, but also that it should take place in New Orleans. Standard procedure calls for bringing young talent to New York for a debut, and all too often the big city and an unfamiliar recording studio produce enough nervousness to make the final results a far cry from what was hoped for. In this case, the younger members had the advantage of being on home ground, while obviouly it would take a lot more than a strange studio to scare the old pros on this date. So Nat, Cannon, and Sam Jones (their regular bassist, fellow-Floridian, and long-time friend) arranged to return to New York from a California engagement by way of Louisiana, spent a couple of days rehearsing and putting things together, and then ripped through this altogether happy and soul-satisfying session. Nat, who seems to me to sound even better, firmer and more inventive each time he records, appears to be additionally spurred by price in how well his idea worked out, and his efforts here can certainly be used to prov-if anyone still needs convincing-that he is one of today's truly major talents. He also contributed the deep-grooved title blues and collaborated on the strikingly moody ballad called R.S.V.P., as well as bringing along Low Brown, a very fitting blues by a young Baltimore pianist, Yusef Salim ("I'd been looking for quite a while for a chance to use this one," said Nat,"and this definitely was it."). Cannonball, in one of his rare sideman appearances, shows-as is often the case-the value of, just for a change, not having to worry about leader- type problems, and comes up with several mean and soaring solos that are the equal of anything he has done in some time. Sam Jones is, as ever, an unsurpassably solid rock and driving force. The three young New Orleans performers have worked together frequently both on r.&b. gigs and in a jazz group led by pianist Marsalis. James Black, who has much of the "parade drums" feeling of local marching bands and traditional jazz imbedded in his work, has fused this with his own complex but swinging approach to produce something that's very personal and new, but that combines smoothly with Jones. Nat Perrilliat, firm-toned and earthy, gets into some highly impressive solos, and clearly belongs to the "boss" rather than the "experimentalist" school of tenor playing. Ellis Matsalis, Jr., is also an effective soloist, but gained his heaviest compliment when one old hand pointed out that his accompaniment of other players' choruses "sounds like Wynton Kelly." Black is a prolific composer-arranger and his two tunes are both unlike what might well be expected from a drummer: the very down-there Sister Wilson and an intriguing waltz, New Arrival. The other new composer strongly represented is Alvin Battiste (who is also a modern clarinetist of real merit). His Chatterbox has fun with its Latin vein, and Mozart-in' (Battiste's nickname is Mozart-presumably a reference to his writing skills, and locally pronounced "Moze-art") offers striking evidence that a blues can be funky and lyrically melodic at the same time. The two short bonus tracks are the result of one of Riverside's occasional attempts at a commercial single. Sometimes-as with Cannonball's "African Waltz" and "Jive Samba" or Mongo Santamaria's classic "Watermelon Man"- such efforts were highly successful; more often, nothing happened. The 45-rpm single (Riverside catalog number R4522) made on this day, utilizing a briefly popular New Orleans rhythm called "the popeye beat," was definitely among the failures. That served to short-circuit a whimsical little hoax: based on Cannonball's claim that as a boy he had been skinny enough to be nicknamed "Spider," we issued the single as by "Spider Johnson and His Popeye Band" and were prepared to exploit this legendary tenor player to the hilt. Actually, you can find a listing under "Spider Johnson" in Jepsen's authoritative 1945-62 discography : he does know that the Adderleys were involved, but is not able to report such other obscure data as the fact that Ellis Marsalis is replaced on piano on the two extras by a notable r&b producer and New Orleans native, Harold Battiste (no relation to Alvin).